How can I describe mundane existence and make it sound interesting? I wish I knew, because this post would be a lot better. March wasn’t too bad. AJ’s mom (Karen) and Mark came to stay with us again. More great food, company and conversation. AJ’s birthday was Saturday. Good thing his mom spoiled him so much when she was here, because I didn’t even give him a card this year. Bad wife! Mom bought us a new rug for the living room. It’s so nice; and we needed it so badly! We’ve been playing catchup for so long that everything is ragged and threadbare. Next are towels, sheets, kitchen rugs and throw pillows. Someday, we will get around to buying ourselves some new clothes. I’ll post a photo of the rug after we clean the place up. That will be this week since AJ’s old pal, Nelson, is coming to visit this weekend. Can’t wait to meet him; and I know that AJ is really excited to see him again. 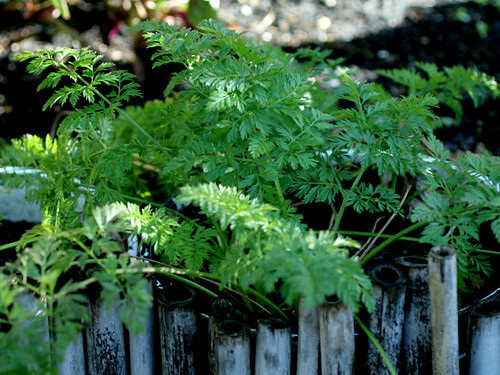 The garden is recovering from the cold snap, and things are starting to happen. 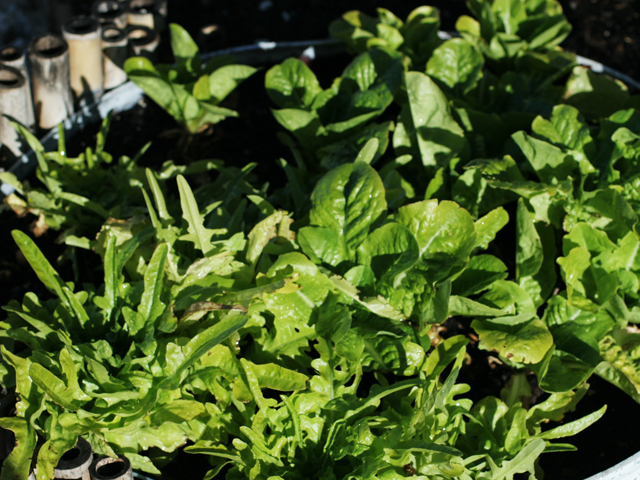 We’ve been eating a lot of lettuce. It looks pathetic because it is heavily harvested. 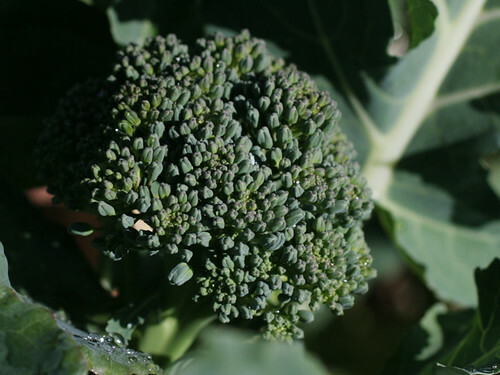 The broccoli never made big heads, but it makes lots of bite-sized florets. 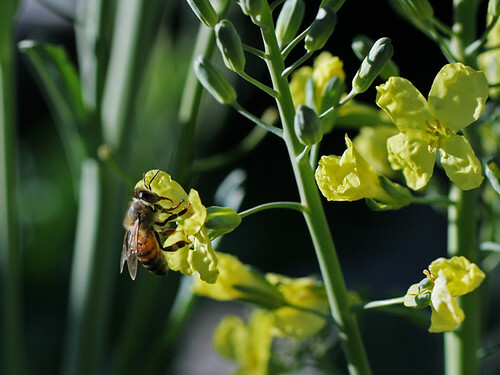 I let the old broccoli plant go to bloom. It is covered with masses of bright yellow flowers. The bees are ecstatic! Every part of broccoli is tasty. We had some flowers on a salad last week. They taste like broccoli, only sweet and delicate. Things are really noisy around here these days. We’ve got neighbors running boat motors, power tools, motorcycles, and lawnmowers much of the time. There are also plenty of dogs barking, traffic noise from the road, and various aircraft on a flight path overhead. 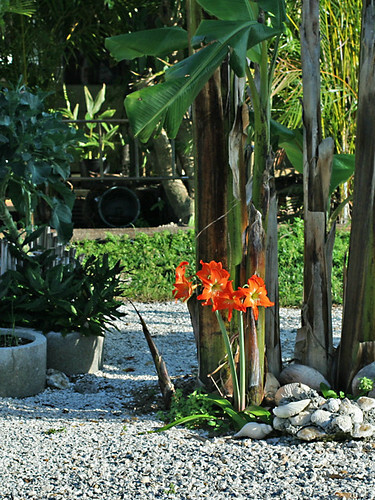 You didn’t think living in a trailer park was a peaceful, idyllic existence, did you? When Karen and Mark were here, we all sat on the patio enjoying our adult beverages when Karen said “What’s that noise?” Having become so desensitized, we didn’t even notice it. “Oh, that’s just our neighbor using his grinder (or something like that)”. “No” she said. “I hear that noise, but this is different.” Eventually we realized that she was hearing the skydiving plane that drops off over the Sebastian Airport, a few miles down the road. The wind direction was such that it was dropping almost overhead in order for them to land in the right place. Nothing unusual. Then, Eagle Eye AJ noticed that this wasn’t a usual drop. 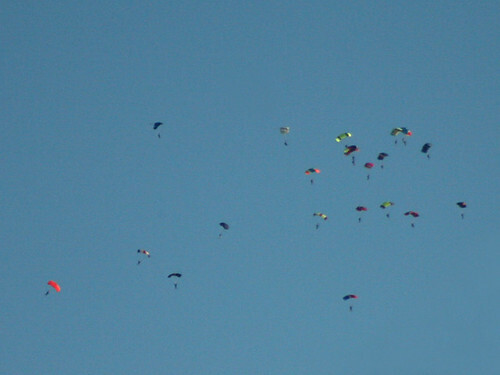 These were pros doing a formation jump. I grabbed the camera and dug out my cheapo zoom lens to take a better look. Snapped a few shots as they came together. 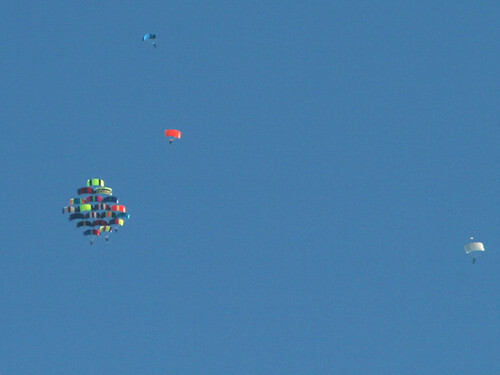 The red chute joined the formation while the blue and white ones circled around. We are guessing that they were photographing. They seemed to float in place for a long time, then they all broke apart and drifted to the ground. Funny that we would have never looked up and saw it had Karen not noticed the noise of the plane. 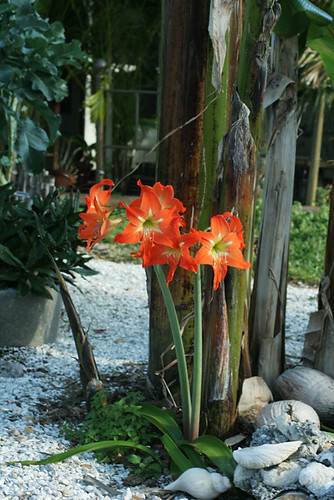 The amaryllis put out two stalks with four vermilion blooms on each. The cats are beginning to scare me. They think it is time to eat, all the time. 30 minutes after their food bowl is empty, It’s time to eat. 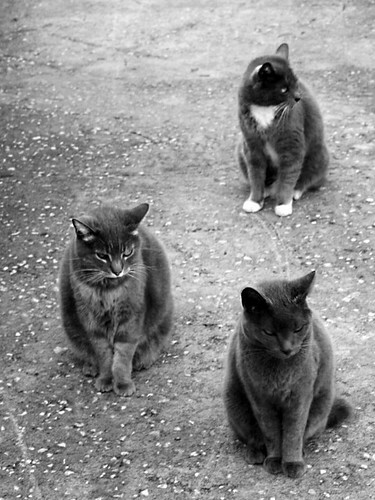 A couple of hours after that they are all following me around in their own formation. I hope that I never fall down and can’t get up. They might eat me!